It was a split night for Oklahoma Wesleyan as Sterling College came to Bartlesville for a Wednesday night doubleheader. The Lady Eagles lost a close one to the No. 17 Lady Warriors, 88-84. OKWU used a 30-point second quarter to take 46-42 lead into halftime in a high-scoring affair. Sterling would quickly reclaim the lead in the early minutes of third quarter. The Lady Eagles would play catch up before tying the game at 73 with just under five minutes left in the contest. The teams would trade buckets down the stretch but a few costly turnovers kept OKWU from victory. Hannah Nealis topped the effort with 16 points. The Lady Eagles have lost three games in a row. OKWU is 15-11 overall and 11-10 in Kansas Collegiate Athletic conference play. The top-ranked men’s team started slow and finished slow, but what they did in between was phenomenal. 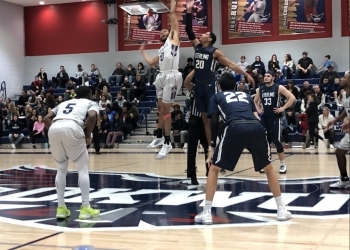 OKWU knocked off Sterling 105-90 to win its ninth straight game. The Eagles found themselves trailing 17-12 at the twelve-minute mark in the first half after a slow shooting start. However, their fortunes would quickly turn as they went on a 22-7 run over the next six minutes to take the lead at 34-24. Lance Tipton’s hot shooting was a big part of the first half surge. This three-pointer from Tipton stretched the lead further. Tipton finished with a game-high 24 points on seven made three’s. Elbert Lawrence also knocked down five long balls on the night. The lead was pushed to 56-34 at halftime. The Eagles would stretch the lead to thirty-three points early in the second half. However, Sterling would stick around, but never get within ten points of the lead. Both teams converted 17 three-pointers in the game. The Eagles are now 26-1 overall and 20-1 in KCAC play. With No. 6 Southwestern’s loss to Avila, OKWU holds a two-game lead in conference with three games remaining. The Eagles host York on Saturday afternoon for a senior day doubleheader.